Every minute of every day a sick child is admitted into hospital in Australia. By going the distance and fundraising for sick kids as part of the Starlight Super Swim, your efforts are going towards helping Starlight bring a splash of happiness to their lives. We’re calling on you to join #TeamSpeedo and take part from any location across Australia and swim (or doggy paddle) at any time between THIS Saturday, 26th Jan and Sunday, 24th Feb. All you need to do to get started in register online, choose your distance and dive into the Super Swim challenge. When you join the Challenge, you’ll be well equipped with training tools and inspo (including programs from our SpeedoFit channels), fundraising tips and with access to the community plenty of support too; oh and some sweet rewards & badges along the way! More than that though… EVERY $ YOU FUNDRAISE WILL HAVE A HUGE IMPACT! 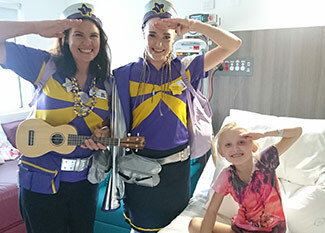 Starlight is the broadest reaching children’s charity in Australia and their programs are delivered Australia-wide 7 days a week, 365 days a year. For every $39 raised you can brighten the hospital experience for one sick child for one year. They help all ages. All illnesses and injuries. In the hospital. In the community. Committing to a swim challenge is a big deal, we get it. But Speedo is on board because it gives us the opportunity to do something we love, for a worthy cause. Every challenging stroke will be well worth it. Simply set yourself a personal distance target to swim within 30 days, starting 26th January. Your distance goal could be anything - there's no minimum. It's your challenge, so dive in your way! The Super Swim challenge is for all ages, all fitness levels, and at any location across Australia. Sign up, choose your distance and how much you want to fundraise. Join Team Speedo and thousands of other Super Swim heroes. Track & log your laps or km’s as you go; and go the distance as a solo swimmer or as part of a team. - Swim as a team- Get the squad together (you may already be doing it, but do it for a great cayse). Have fun, and help each other along to achieving some great results. - Get the kids involved! Who can say no to that cute little face? Parents can get kids involved through swim schools, help them learn and have fun. - Donate. You don’t have to be swimming the challenge to be able to help – simply head to the donations page to donate. Ask people to support your fundraising. Make waves with fundraising tools and exclusive rewards! Go to Starlight Super Swim to register or for more information. On behalf of Speedo, the Starlight Children's Foundation & Starlight Kids, we thank you for your support!